____Hello guys, It's been a while that i didn't post some technique article. So today, I post a article translated for 4 weeks about environment art pipeline to share with you. Article from : Vertex Art 3Q ! 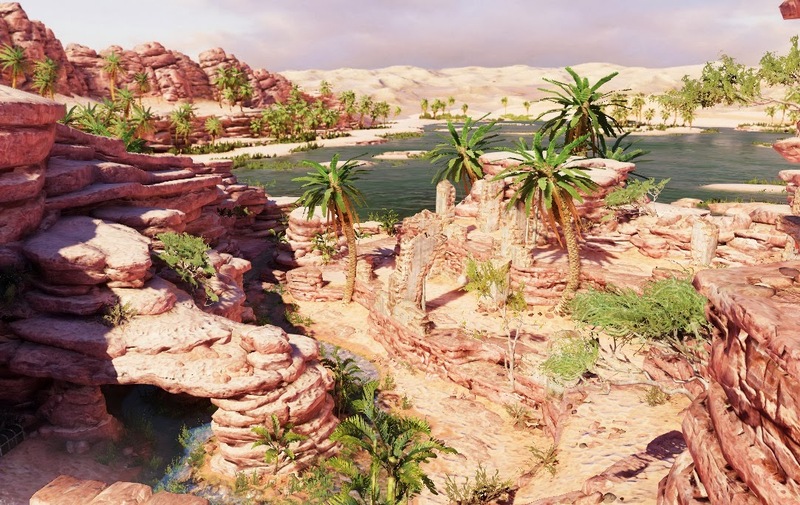 ____When creating the Caravan level in Uncharted 3 I knew its size would be the major issue that would cause the most problems. Creating the massive environment needed for a high speed horse chase through the cliff canyons and out in the desert while reducing the all too common problem of noticeable repetition would be the crux of this issue. 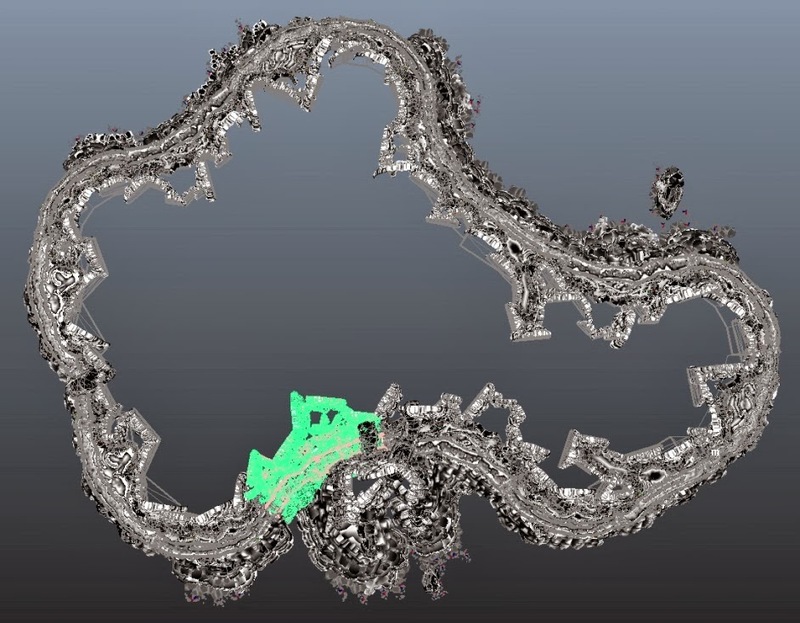 This article focuses on aesthetic and technical decisions made to help alleviate this problem while going over a method I used to create a very vast environment within a production cycle. ____When going about constructing an environment it is important you stay as far away from a modeling package as possible until you have a large library of reference images, this the key to creating believable words. Without a good foundation and understanding of the location you are striving to replicate in 3d, your environment will have that all too familiar 3d look instead of being a world viewers can truly escape to. This is where you can plan out the most important visual aspects of the environment and determine what is important to keep from your reference and what is not. You want to include what is visually striking, what will help set it apart while keeping within the set style of your project. You don’t want to fall into the trap of trying to do everything possible and having everything suffer for it. ____To help combat the problem of noticeable repetition from overusing a small handful of very unique models in such a large environment I went with the approach of creating a vast library of different models utilizing blending and tilting texture sets. There are many benefits to this approach of work with not to many downsides. 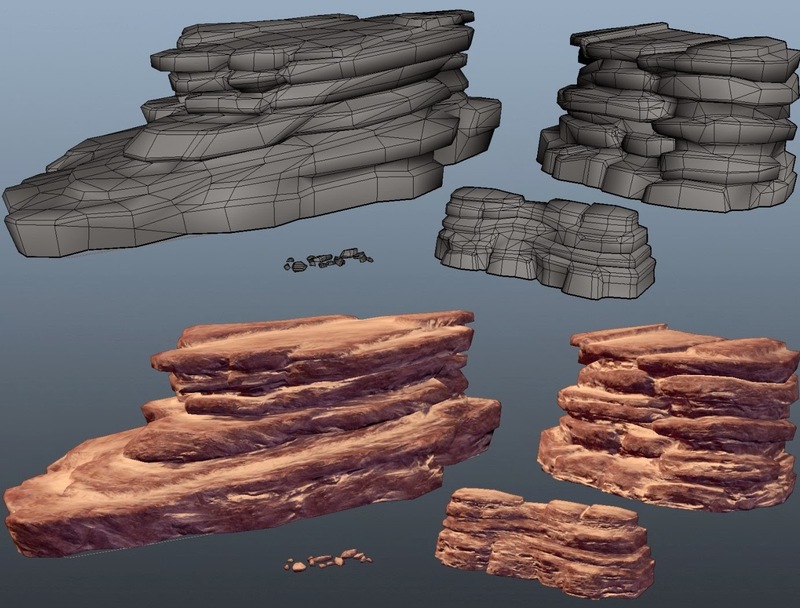 Having a much larger library of rock assets to choose from helped create a much more organic look to the environment while minimizing the noticeable repetition. Changes to any model could be made without fear of destroying uniquely created maps at any stage of production giving me freedom to constantly improve and optimize the model as need be. ____Not only did I utilize a high model count for the environment but I also reduced how much each model differed from each other. Now this might seem like a counter productive thought process when the whole point of having a larger library of assets was to give you more variety, but the reason this was done was to give the level a better sense of cohesion. The issue with creating too many “unique” rock assets is that they will eventually stand out, and they become harder to blend with the other rocks and elements in your scene. 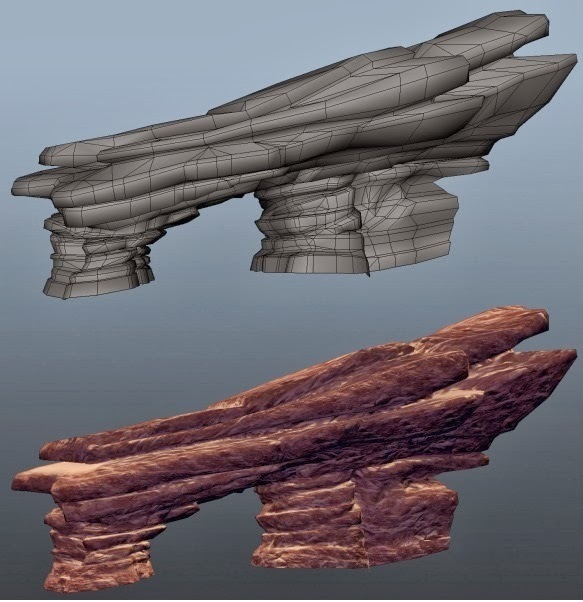 It will look more like models are simply place next to each other instead of a solid flowing rock form that looks unique due to the diversity of models used while still maintaining the look that it is all the same cliff face. ____Now let’s not get carried away and think each model should look exactly the same. This is untrue, we just want to minimize the amount of unique details that will stand out and betray the illusion we are trying to create with repettous elements. Silhouette should be the main focus of the model while maintaining a consistent look through out each piece and limitng the amount of very exaggerated unique details. This of course does not limit you to only creating assets that look very similar. Much like your details you want to use the more standout assets sparingly and in places that you wish to draw attention whether it is the focal point of the scene or you are trying to use it to guide the player. ____While the models themselves differ from Large, Medium to Small each carries through similar defining elements such as the chipped/layered look. These types of decisions on what style and types of elements you wish to carry through your models should be determined before hand to keep a sense of cohesion throughout your level/assets. But how do we make the world so large? 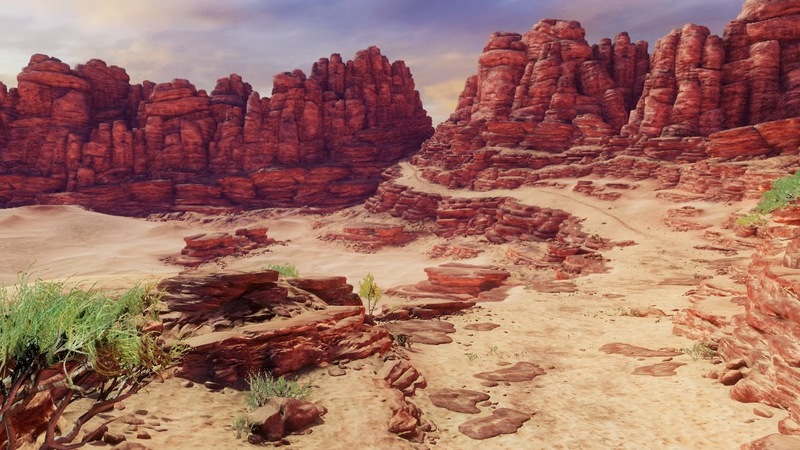 ____The last section of the Caravan level in Uncharted 3 is a daring battle on horseback high up on a cliff ledge overlooking a vast barren sea of sand. What most players (hopefully at least) don’t realize is that they are actually in a never ending environment loop. ____This gameplay section is not on rails, there is no end point and each player will complete the level at a different point. To achieve this result the level had to be constructed in a loop, a very wide one at that to minimize the fact that you are going in a circle and to compensate for players of varying skill level. Most players will never traverse through the entirety of the loop but it still has to all be there for those that will. ____Utilizing the fact that we have a huge library of rocks at our disposal will help us create these large environments while keeping every area looking unique. How was this done then within the constraints of a normal game production cycle? Simply making things more modular! ____At Naughty Dog I use what we refer to as “Nested Scenes” to create the miles and miles of track needed for this section of the level. These Nested Scenes are modular mini scenes within themselves. They are constructed much like any area of the level, they are built using many modular assets, unique terrain, specific game flags, and include things such a collision and shadow proxies. Everything about them is created exactly as a normal gameplay section would be except they are created with the intent that the start and end section will link up with another Nested Scenes much like a piece of train track. Using this method I created about 5 unique sections of terrain and assembled these modular sections in 1 master scene file. ____Example of a Nested Scene. Created much like a regular level section that can be placed in a master scene like any normal instanced asset. To give a sense of scale the flat terrain section the player can move around in is about 5 truck widths wide. will be reflected in all subsequent scenes it’s being used in. ____A top down view of the main scene file for the Cliff Loop. With the Nested Scene above selected you can see how large the loop actually is and attempting to create this any other way would be an extreme waste of time. ____When creating large Nested Scenes like this, much like with individual assets, you want to keep the extreme uniqueness of these scenes to a minimum to reduce the chance players will begin to notice that they are traveling past the same chunk again and again. To break up the boringness of this and add spice to our level we will then want to go into the master scene where all our large track pieces are laid out and then add in extra details on top. These extra assets added into the master scene will help make each section of your level look unique and disguises the fact that you are repeatedly going over the same track section again and again. _____The same track section as above only with extra detailing assets placed in the master scene to break up the look of the area giving off a completely different feel while reducing the amount of unique work needing to be done. aesthetics of the level. Breaking up the look of the loop is important but you don’t want to stray from the core look of the level just to make things look different. ____Within game development an artist will always have to adjust their levels based on changes in story and gameplay. Having things extremely modular and easy to edit will alleviate a lot of the issues you will eventually face. One of the worst things an artist must deal with is when sections of a level must be cut due to changes in design or time. This happens on all projects and multiple times within my level during the creation of Uncharted 3. Utilizing the modularity of Nested Scenes, not as much time was wasted changing or removing large sections of gameplay as opposed to if I had made every section from scratch. ____This technique was also used to create the endless sea of sand dunes earlier in the level. These were a bit more difficult as they required the edges to be completely seamless not only the model but also with the textures. ____Remember the points I brought up in this article are by no means the correct way to go about constructing your environment. There are many factors that come into account such as art direction, design, style of gameplay, and technology used at your studio. These are a collection of thoughts and tips I used for creating the Caravan level in Uncharted 3. The biggest advice I can give is really to think for yourself, do not rely on tutorials and articles written by others. There is no right and wrong way to create environments. Experiment and decide what works best for you on any given project. Most of all have fun doing what you love. 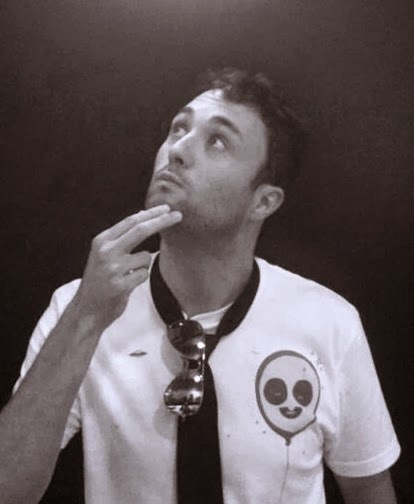 ____I graduated from the Art Institute of San Diego California and got my first job working up at Bungie on Halo Reach as an Environment Artist. 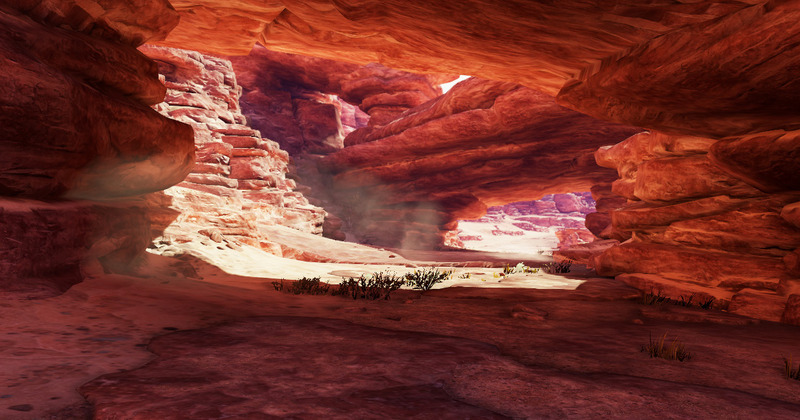 After Reach I joined all the talented folks over at Naughty Dog and worked on the Caravan level for Uncharted 3.